Thanksgiving is right around the corner and here are some of my favorite videos, primary documents, virtual field trips and lesson plans for all grades, K-12. 1) Students can see aspects of lifestyles, housing types and economic activies of both the Pilgrims and the Wampanoags. For more resources about the Mayflower and the historically re-enacted village, see the Plimoth Plantation website. 3) This NY Times interactive highlights regionally distinctive Thanksgiving Day dishes from each state. 4) In addition to this list of distinctive Thanksgiving recipes from each state (I’d love to try so many on this list), the NY Times has also produced this list of the most ‘Googled’ Thanksgiving recipes in each state. These are very late additions to my favorite Thanksgiving day resources. Happy Thanksgiving everyone, and may yours reflect some some regional distinctiveness and cultural context that you appreciate. 5) The great poster below (hi-res) with the accompanying data (available in ArcGIS online) is a great way to visualize how the agricultural industry supports and shapes Thanksgiving customs. 6) One of my favorite combinations of maps for Thanksgiving involves the geography of food production and food consumption. When we start looking at the regional dishes on the Thanksgiving plates we can see some great patterns. This ESRI storymap asks the simple question, where did your Thanksgiving Dinner come From? 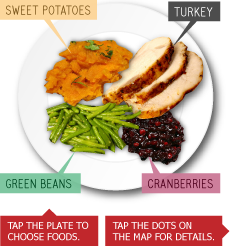 This StoryMap is a great resource to combine with this New York Times article that shows the regional preferences for the most popular Thanksgiving recipes. 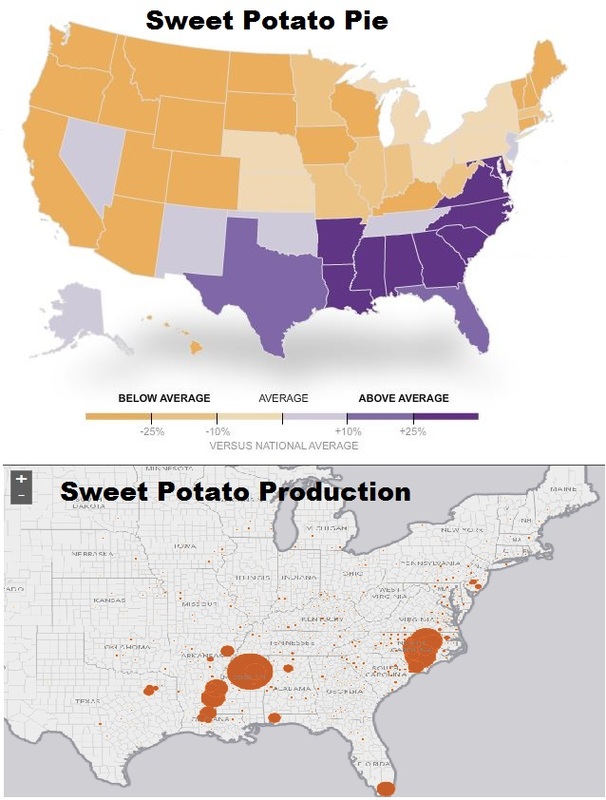 Where are sweet potatoes grown? Where do people make sweet potato pie for Thanksgiving? 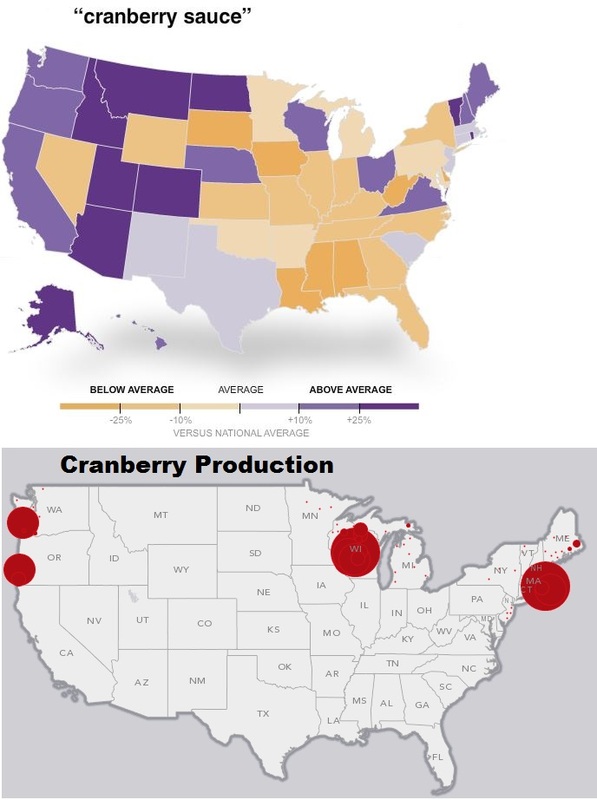 Plymouth County, MA is one of only 3 cranberry producing regions and is was also home to the first Thanksgiving. How has this New England local ecology and traditional food patterns influenced national traditions? 7) Thanksgiving has some fascinating historical and spatial components to it. My wife and I prepared an article for the Geography News Network on Maps101.com that shows the historical and geographic context of the first Thanksgiving and in the memorialization of Thanksgiving as a national holiday (if you don’t subscribe to Maps 101, it is also freely available as a podcast on Stitcher Radio or iTunes). For these and more Thanksgiving resources on scoop.it, click here.